orders@voxel8.co Inquiries about existing Voxel8 Developer's Kit purchases. 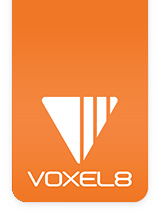 support@voxel8.co Technical issues relating to the Voxel8 Developer's Kit. sales@voxel8.co Inquiries around billing, invoicing, or other business related questions. hello@voxel8.co General questions about Voxel8 the company, or the Developer's Kit 3D Printing platform. The Voxel8 based system for Slicing 3D prints for the Voxel8 Developer's Kit. store.voxel8.co Where to buy consumables for your Voxel8 Developer's Kit Printer, such as conductive silver ink, build tape squares, & other replacement parts. The location of the Safety Datasheet information about the multi-materials we supply with the Voxel8 Developer's Kit Printer. This support website containing documentation on the Voxel8 Developer's Kit printer.